Haunted House, Halloween Party, Horror Castle, Torture Chamber, Dungeon, Murder Mystery Theme Decor Prop Accessory. Creepy door cover, featuring bloody handprints and smeared blood and body parts strewn about from a recent frenzied massacre! 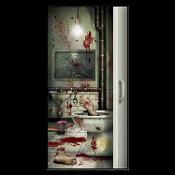 Realistic looking door displays torture chamber bath decor, complete with scary bloody spatters, smudges, drips, drops, carnivorous bugs and bloodied weapons.